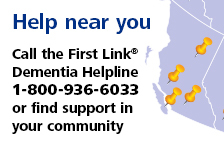 Living safely with dementia | Alzheimer Society of B.C. This workshop offers strategies for ensuring the safety of the person with dementia in the home. Caregivers will learn ways to prevent the person with dementia from getting lost and what to do in the event of a wandering incident. Information about products that may help keep the person with dementia safe will also be provided.